The actual entombment takes place at night on the third or fourth day, and it affords one of the most impressive scenes that can be imagined. The church is closed and is only lighted by the torches carried in the procession, as the body is borne from the Chapel of the Blessed Sacrament past the High Altar to the Chapel of the Canons, where it is deposited in a coffin of cypress wood, which is enclosed in lead and finally placed in a casket of oak or chestnut. In the inner coffin are laid purses containing coins struck in various years of the late Pope's reign, and a brief history of his chief acts inscribed on parchment and enclosed in a metal tube. The inner coffins are sealed by the Camerlengo and other high officials. The tomb is situated in a niche in the wall over a door on the left-hand side of the chapel. Here the body reposes until the tomb to be erected to the Pope's memory by the Cardinals whom he created is ready to receive it. If it happens that at the death of the Pope the coffin of his predecessor is still in his provisional tomb, it is removed to the crypt under the church. The body of the Pope is buried at night in a niche over a door in the Chapel of the Canons in St. Peter's at Rome. In the meantime the Vatican is being prepared for the assembly of the Conclave which is to elect the new Pope. All the Cardinals are summoned to attend, and the rule for the last six hundred years has been to commence the work of election on the tenth day after the death. 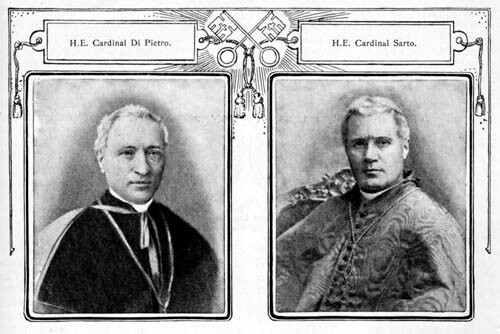 This worked well enough when all the cardinals were resident in Europe; but now that members of the Sacred College are scattered throughout the world, it is obviously impossible for them all to arrive in time, and Pius IX authorised the conclave to commence work as soon as two-thirds of its members were assembled, without waiting for the rest. As Leo XIII was Camerlengo at the time, and took a leading part in drawing up these rules, it may be assumed that in the new laws that he has laid down for the Conclave this principle has been maintained. Many of the ancient rules have been modified, as a result of the changed position of affairs created by the loss of the temporal power. 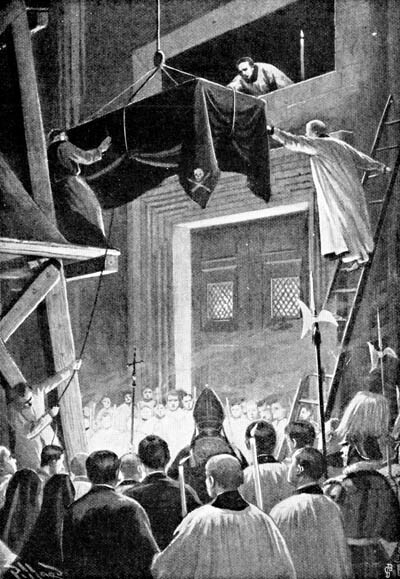 The very name Conclavederived as it is from clavis, a keysuggests an assembly with locked doors. Privacy and security from outside interference are of the first importance in the election of a Pope. The assembled Cardinals are strictly enclosed until their deliberations result in an election. 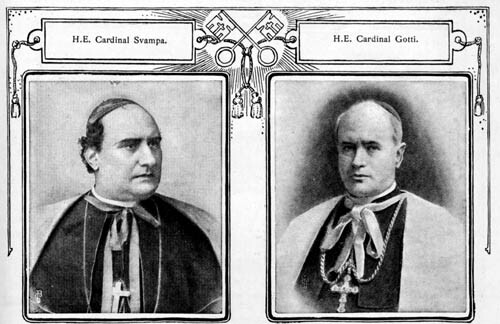 Four Cardinals who are regarded as probable candidates for the Papacy. This practice dates from the latter part of the thirteenth century, when the Cardinals assembled at Viterbo after the death of Clement IV, and deliberated for two years and a half without coming to any decision. The people then locked them up in the Bishop's Palace for some weeks, but as this resulted in nothing they proceeded to take off the roof and to limit the food of their Eminences to bread and water! The Cardinals then appointed a small committee to elect a Pope, and thus the business was brought to a satisfactory conclusion by the election of Gregory X.